Character sheets are an essential part of tabletop gaming, and whether they’re a few notes scribbled on a piece of notebook paper of a meticulous 12 page spreadsheet kept solely on a tablet PC. While crucial to the game, character sheets can also cause some problems at the table. Poorly conceived layouts, missing stat boxes, swaths of unnecessary information and unreadable fonts can make an utter mess out of combat and skill tests. Luckily, there are a number of dedicated, talented individuals who churn out dozens of excellent sheets for a variety of games, and we’ll be looking at a few of them after the jump. Voidstate is a favorite of mine. Their sheets are smooth, functional and Euclidean, accelerating combat and putting all the information you need for quick reference right where you need it. They don’t bother with a lot of fluffy nonsense; the sheets are light, quick and easy on your toner cartridges. The site also has a number of different tools and reference sheets available, including a hacking flowchart for Eclipse Phase that looks pretty damn sweet. With a title straight out of the 90’s, Wordman offers up a plethora of sheets, maps, tools and other resources for a plethora of games, with a lot of emphasis on Shadowrun and some custom setting rules, maps and generators for Exalted. His contributions have been invaluable for my excessively large Exalted game, and his contributions to other systems look just as good. Mr. Gone is your go-to-guy for everything White Wolf. His sheets are beautifully made, well designed, and cover a huge variety of settings within the individual systems that White Wolf has produced. I’ve been a fan of his work since I first started slinging d10s, and his sheets range the spectrum from the sublime to the sarcastic, Victorian Changeling: The Lost to Chav: The Knifing. 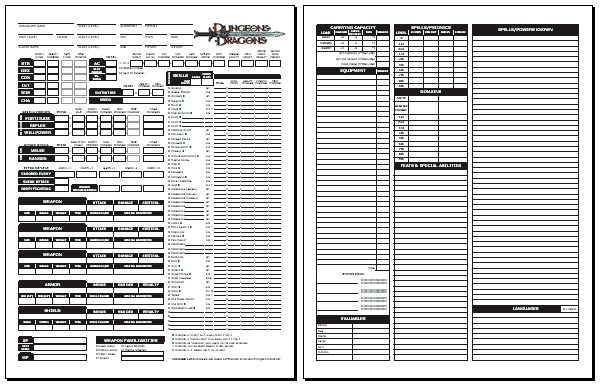 This page is a great resource if you are looking for custom, off-beat or incredibly specific sheets for your d10 game. You left off one of the best.